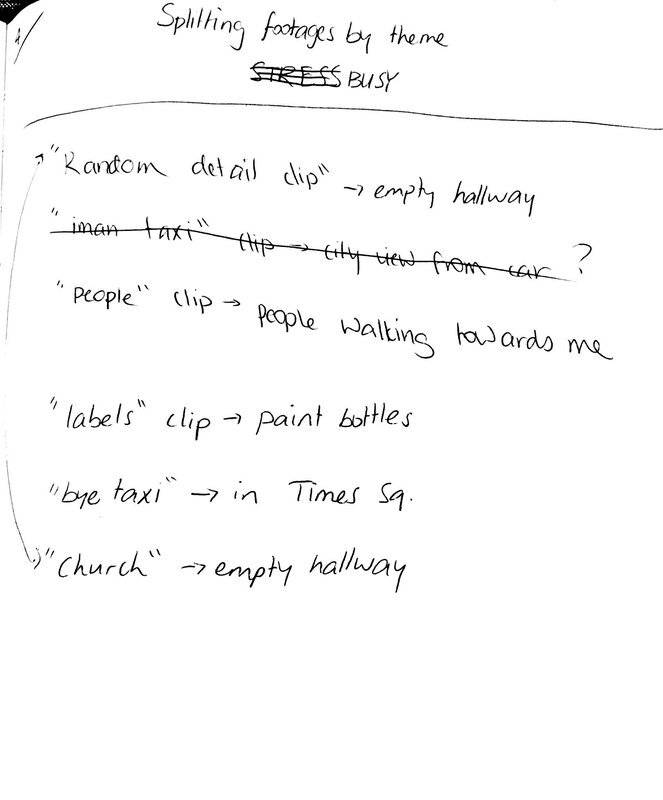 As a New York City system, I decided to concentrate my research on the issue of protests and public demonstrations. 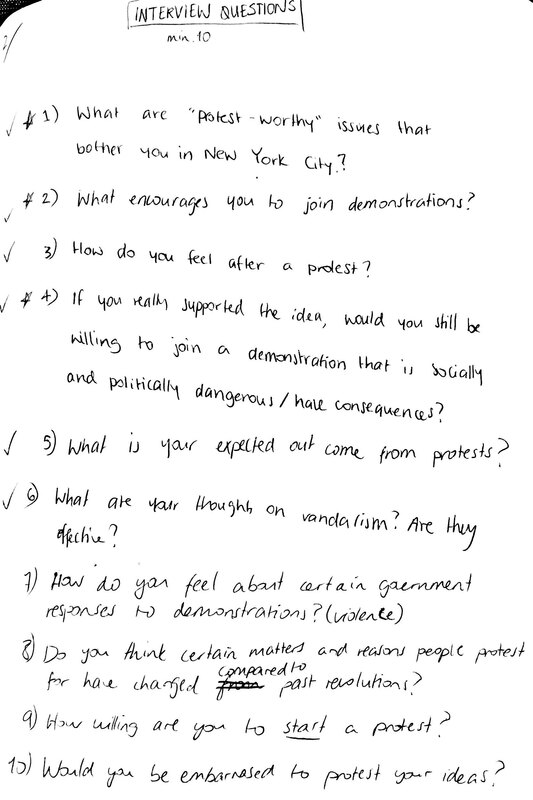 In order to have background information for myself, I did some research on general interviews with people during certain protests (not all necessarily in New York) and brainstormed my own set of questions after hearing the themes of most answers. 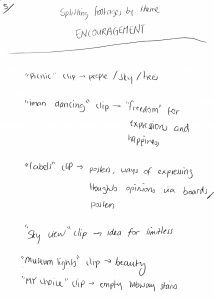 This project consists of people’s general thoughts on protests and public demonstrations. 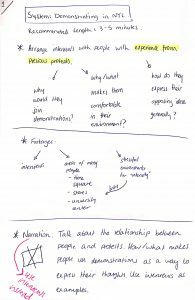 I came up with a series of questions to ask a few of my friends who have experienced a protest at some point of their lives in order to compare their ideas and put them together in the video. 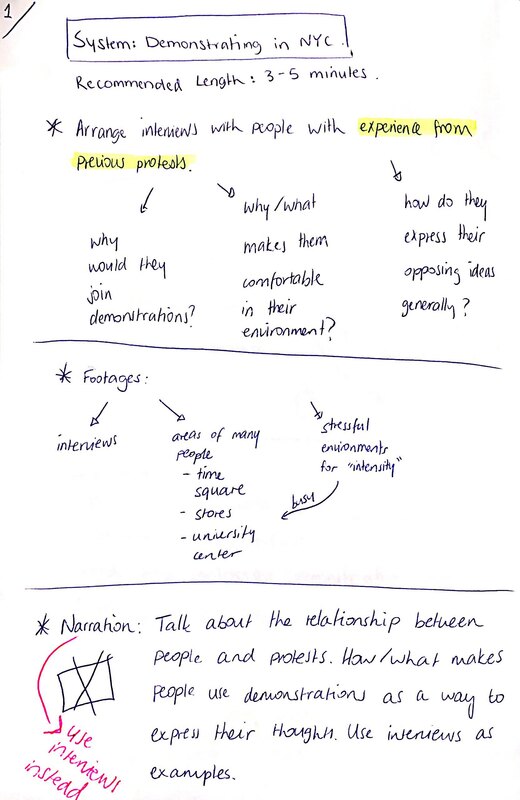 My interviewees talked about their ideas and opinions on protests in terms of uniting with people to fight for “beliefs” or “change”, or attracting attention in order to achieve these aims. 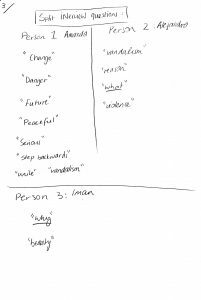 I divided my questions into certain themes in order to receive organized answers: danger, peace, organization, change and vandalism. 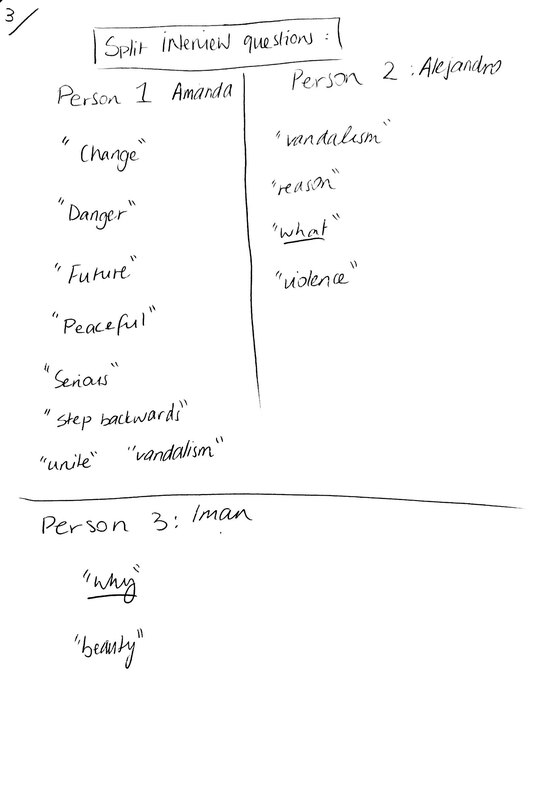 To put together the video, I searched for speech sections in each of the interviews for the themes that I came up with and thus separate the video accordingly to their narration. Visually however, I had work to do. For my footages, I decided to build up on my previous clips instead of extracting real videos from YouTube (as I aimed to do previously) in order to attract more attention to what the interviewees are saying. I think that if I put videos of people constantly moving with posters and such would make the footages busier than what I had aimed to do, having a tranquil “environment”. 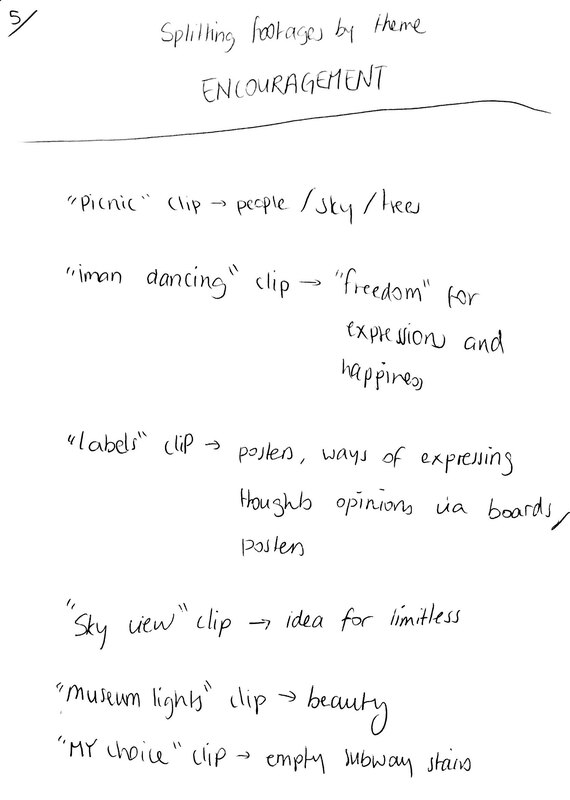 From my previous clips shown in class before, I received feedback mostly on background music (since I had none). Thus, I wanted to change this by adding something that was easygoing. 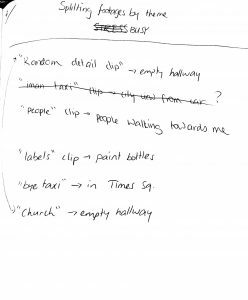 Initially I was not planning on putting any songs just like before as I thought the natural sounds of the city (people, cars, etc) would sound more realistic and “protest-like). However, for a video that turned out to be 3 minutes, I changed my mind and placed a song that is not too distracting for the audience. Although I have included my friends’ opinions, I have excluded mine. I initially wanted to use my voice for narration and include the interviews in certain sections of the video. However I liked the idea of using my interviewees for narration.